Just a heads up. 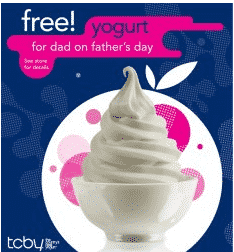 If you happen to have a TCBY near you, they’ll be offering dads a free frozen yogurt on June 19th for father’s day. Click here to find your nearest TCBY and be sure and call to make sure your location is participating. We’ll remind you again as the day gets closer.